In addition to receiving a few questions about Bitcoin from a few relatives over Thanksgiving, the other common question/comment was "can you believe this stock market, how long can it last." I confess I do not believe in market timing nor do I have a crystal ball; however, that does not mean one should put their head in the sand and ignore important market signals. Aside from the importance of monitoring weekly economic data reports, investors can review a couple of high level data points to gain perspective on the health of the economy and companies broadly. Just as earnings growth is important to evaluate at the company level, market level earnings are important as a rising tide may be lifting all boats. There is truth to the fact that stock prices have a tendency to follow earnings and that is clearly evident in the below chart. From late 2014 through early 2016, S&P 500 earnings (green line above) were range bound and moved sideways during this period. The S&P 500 Index moved sideways over this time period as well. The market bottomed in February of 2016 and the beginning of the S&P 500 uptrend coincided with an improving earnings picture. 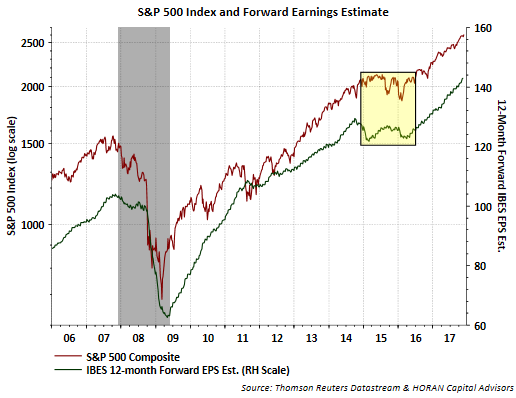 The below chart is a different look at the earnings picture by showing the 12-month forward growth rate expectations for the S&P 500 Index. 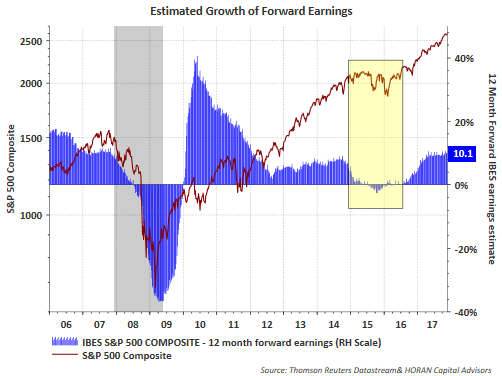 The chart shows earnings growth at 10.1% looking twelve months out into the future and if stock prices follow earnings, market returns could be in the low double digits too. I suppose the market's resilience, i.e., very little downside volatility could be viewed as a concern. 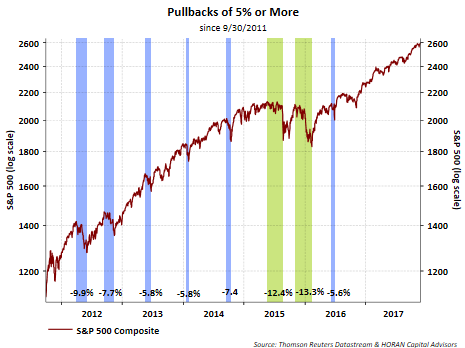 The last greater than 5% market pullback occurred over a year ago, in June 2016, and the average intra-year pullback since 1980 is 14%. 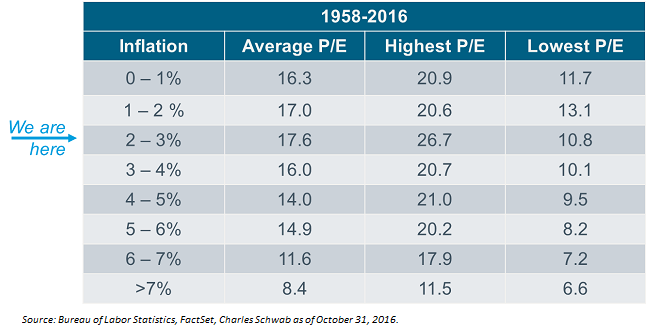 I could show a number of charts indicating the market is trading above its long term average valuation level. Often missing from these valuation charts is the back drop or perspective of valuations in a low interest rate environment. Stocks can and do trade at higher valuations when interest rates are low like they are today. 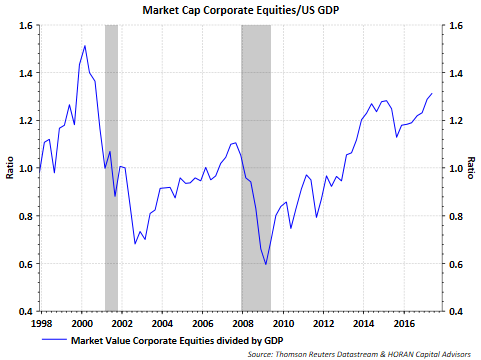 One of Warren Buffet's favorite valuation measures is the market cap of corporate equities to U.S. GDP. Some strategists expressing a bearish equity market point of view will show the below chart to support their negative perspective. 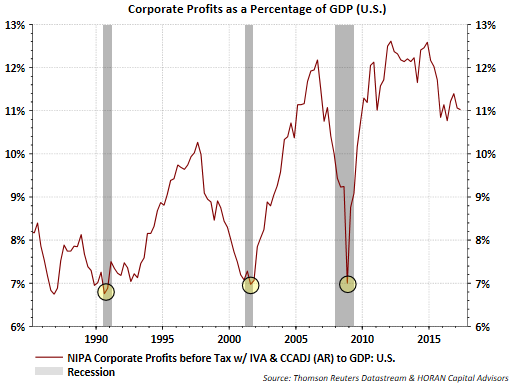 Again, at the risk of sounding like a broken record, corporate profits as a percentage of GDP remain near record levels. And finally, what about the economy? The last two quarterly GDP reports show economic growth at 3% or higher. 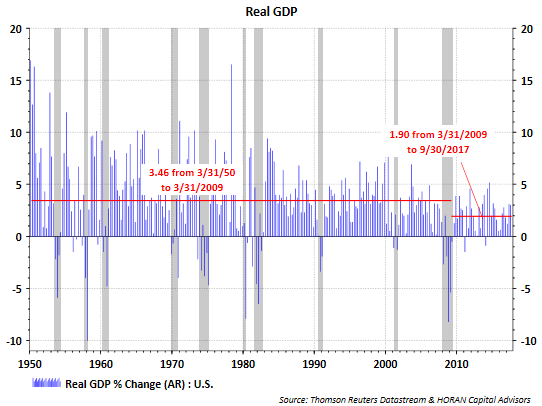 This is pulling up the below trend economic growth rate that has been reality since the end of the financial crisis. A faster pace of economic growth is a large positive. At the end of the day, the market may seem like it is priced for perfection, but in a low interest rate/low inflation environment, this does not seem unreasonable as noted above. Corporate earnings and the economy are both experiencing growth and growth that is accelerating. These two variables alone are positive for stocks. I have written a couple of recent posts about the length of this bull market cycle that began in early 2009 and the benefit for investors to review their overall asset allocation. A pullback will take place, but all else being equal, the economy and corporate earnings seem to be on sound footing.